Working with an astute and proactive Insurance Broker will help you convince the underwriters to lower your premiums if you are willing to defend raw lumber from fire because it is the new way to go today. The best approach is to have a pro active broker that is willing to work along side you to embrace new technologies to show the underwriters willing to help lower your premiums which oftentimes consume your margins. Just last week, I was invited by Andy Giza with a extremely knowledgeable team out of Denver from Lockton Companies, to introduce M-Fire™ products to their building clients. This group is like no other, trying to help their builder/ clients and in turn help themselves in showing underwriters ways to lower risk in wood framed building during construction. After being in this business for over 40 years, I have never meet a group that is as proactive for their clients. Lockton Group brings solutions to there clients, so they are better equipped when they go shopping for the best coverage and rate. There are a lot of reasons why builders don’t like insurance companies because today’s risk premiums can sometimes determine whether a job is profitable or not. If you think about it the development of new strategies to lower the risk perception has to now become a full time position for building big companies or you lose your competitive edge. With all the recent arson attacks on high density wood framed buildings, underwriters are surely watching the same YouTube videos you are, watching workers jumping out windows and off decks to escape a job site fire you must provide a solution that is believable now for a premium discount. These arson type attacks are just happening too frequently with over 20 in the last 18 months it's even impacting mass timber CLT premiums. Todays builders have to be on there A Game when it comes to risk for the underwriters and their owners because these arson attacks create a very costly set back. 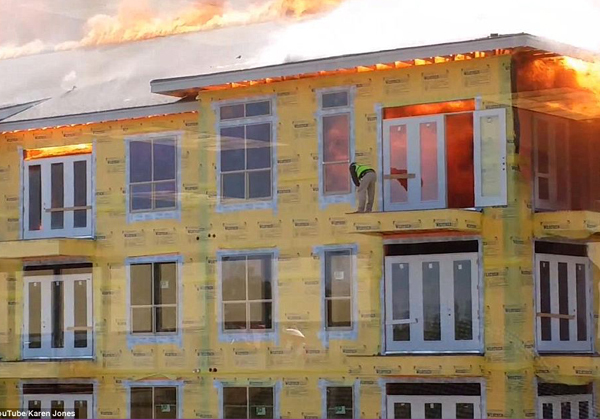 Firefighting and construction industry professionals say wood-frame buildings are largely fire safe once completed thanks to measures like sprinkler systems, but when those systems are either not yet in place or not yet operational, wood remains highly combustible.